Portable Magnetic Drill – CSU 100/3RL | Advance Drills Inc.
Portable Magnetic Drill – CSU 100/3RL Powerful reversible motor for drilling and tapping – holes up to 4″ dia. Model CSU 100/3RL has a powerful reversible motor for drilling and tapping. 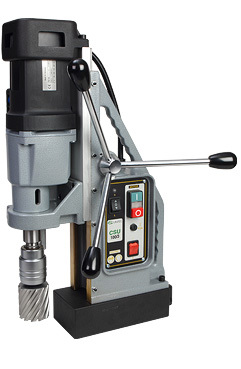 It’s 10″ stroke is ideal for drilling structural steel. 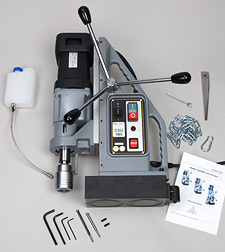 Standard equipment includes Auto Chuck cutter holder, carrying case†, safety chain, carabin hook and allen keys. † Steel case intended mainly for shipping purposes. Tapping capacity up to 1-1/8″ dia. • High-density dual-coil magnet has holding strength of 6600 lbs. Magnetic Force (1″ Plate): 6600 lbs.